I know this will seem like deja vu to you all, but here it is again: French Foliage! Fold a 5 1/2" x 8 1/2" piece of More Mustard card stock in half, creasing it well with a bone folder. Using Stamping Sponges with the matching inks, sponge all over a 5 1/4" x 4" piece of Whisper White card stock. The inks used at this time are Cherry Cobbler, More Mustard, Always Artichoke and Cajun Craze. Keep adding splotches of the various colors until the entire piece is filled with color. Make some areas a little lighter, some a littler darker. The contrast will be good in your final product. Over the colored area, stamp the leaves in varying positions in VersaMark, trying not to overlap the leaves just too much. Cover the entire area with Clear Embossing Powder. Use a pair of tweezers to hold the paper while you use the Heat Tool to heat set all the leaves. ink. 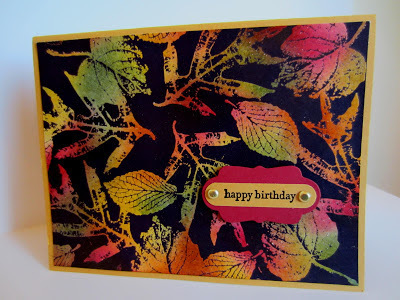 All of your beautiful colors should shine through the embossed leaves! Adhere leaf piece to card front. any of a number of other labels if you don't have the Matchbox Die. On a scrap of More Mustard card stock, stamp the sentiment (could be replaced with Happy Thanksgiving if you choose) with VersaMark ink. Add Black Embossing Powder to the sentiment and use the Heat Tool to emboss. Turning the Word Window Punch upside down, insert the sentiment and center in the window to punch it out. Adhere the sentiment to the red label. Adhere the label to the card front with two Stampin' Dimensionals. And, with this card, I promise I won't bother you with the French Foliage stamp set anymore -- well, at least, for awhile. What a beautiful card. I have got to try this!! Beautiful, I love the colors! Thanks so much for linking up on Super Sweet Saturday. This one's pretty too, and at first glance I knew it was one my son's teacher would love to receive.